Suits families looking for a quiet, relaxing holiday with regular transport links to the local shops, and restaurants and the nearby beaches of Fenals and Lloret. 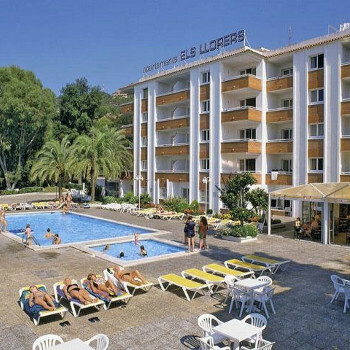 The Els Llorers Apartments are made up of four buildings, situated in a quiet residential area. me and my friends had booked this cheap holiday and after reading a few reports after we wasnt expecting it to be at our standard, people were coplaining about everything, but, when we got there and spent the week there we did not want to come home the staff were really nice, the rooms did not get cleaned but if we needed anythign we could just ask, the reception was up a little bit of a hill which was tiny but nothing to complain about. the rooms were basic but when your on holiday what do you expect your out most of the time anyway. we did not have to pay 100 euros when we got there which we thought we had too. the supermarket was literally less than a minute away with a lovely irish woman there, the sho was cheap :). me and my friends woyuld definatly come back to ths hotel again. however it could do with being nearer to the town centre. we had a lovely view from out window we was only on the 1st floor n we had a pool and sea view. the higher up the apartment on a night was a sight to be seen, with the lights from the town, the sea and the lights by th poool. i would recomend this place to young people. The room was clean but basic. It was a cheap holiday which we booked in January 08 after reading some of the reviews we were worried but we needent have been! Apart from the fact that it was 1am and we had to walk up the hill with a pushchair, 3 suitcases and a very tired 4 year old! The hotel is on a hill - no getting out of it - it is steep although it is very short. There is a shop (owned by an English lady) at the bottom of the hill and they were very friendly and helpful. We had a first floor room (accessed from the rear of the bar) and we had a wonderful view. It was a bit of a walk into town although there is a cheap bus that runs every hour and a half from the hotel (not directly outside - you need to walk down the hill and turn right). 100 euro deposit on arrival and on a very steep hill. Everything such as fans, tv's and safes can be rented for a price. This aside it is a cheap holidaywith with limited evening entertainment and limited kids club activities. You get what you pay for! Booked this bargin holiday 12 mths in advance offer in shop window three hundred and sixty pounds for two adults an two children, a part of me thought does it matter what the accomadation is like as it was so cheap the other part of me thought what type of place will it be as so cheap! I feel we paid what the holiday was worth no more no less. the rooms appeared to be clean, look under beds and corners for dust and dirt, rooms not cleaned all holiday although a mop and bucket are provided and notices do advertise cleaning kits to buy for your own use, notices are also displayed informing of the ten euro charge for cleaning and empting the bin at the end of the holiday if you do not do it yourself. Sheets not changed once towels changed twice,there was no entertainment not that we would have stayed in the bar/cafe/playgroup/gamesroom. Weather was very good traveled with friends and family accomadation ok if you go out day and night so location is not ideal if you wish to escape from the poor facilities. Very under staffed, staff that were on duty were not particualy helpfull, supermarket ten mins walk, shop at appartments although British ran is expensive and offers a very low exchange rate worth using the locals in town,they are alot friendlier also. We had a good break away and got what we paid for I would not recomend this accomadation. When we arrived we were extremly disappionted. The room was relativly clean but the cleaner only came once during our week stay and that was only to bring clean towels. The hotel was situated quite far away from the town and up a steep hill, although there was a cheap bus service that ran frequently. The staff were extremly friendly and helpful. The entertainment was really poor in fact it was rubbish! the only good thing that I can say about this holiday was the excersions that the rep organised. I wouldnt ever go to these apartments again as I was extremly unhappy and couldnt wait to get home!! Apartments were clean with sheets and towels changed a few times a week, we stayed for 2 weeks. I found the hill steep and had to take a lot of taxis which I found expensive. The staff were miserable the first week but gradually thawed a little in the second week. The bar food was not very nice, but there were nice restuarants near by. We were out most nights but the nights that we stayed in we found the entertainment ok. I would visit the resort again but I wouldn't stay in the same apartments. The rep was brillant especially the second week when one of the party was taken ill, she helped us find medical services etc. Apartment was very clean and staff were friendly enough. The location of the apartments was on a very steep hill. Our Father of 63yrs found it extremely difficult and therefore we had to result to taxi's in and out of the complex. The entertainment was very poor. The larger apartments, although very spacious, were situated even further up the hill. Although we had the use of a large terrace outside our apartments there wasn't any patio furniture at all therefore you couldn't sit or eat outside. We spent a week at Ells LLorers which was quite enough. Certainly not for the elderly, families with young children with prams etc or people with physical disabilities.